Two Girls in the "Lion's Den"
We've had more requests for this one spot than any other. It was inspired by a message brought to the congregation at Faith Assembly in Summerville, by their guest speaker, the Reverend John Kilpatrick. The spot gives an overview and insight to where God has been bringing us along after these two-thousand years. The Lord has been creating a worshipping Bride! 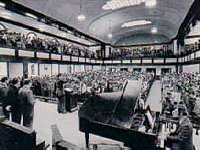 The Azusa Street Revival grew the Church and changed the world forever. This was a major glimpse into God's heart on what He began in the early Church. Whether you have heard of it or not, you've been greatly affected by this event. Hear how God moved through the heart of a hungry soul and how that hunger unleashed a tidal wave of God's presence and salvation to hundreds of millions around the world. 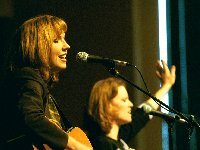 When two girls were led by the Holy Spirit to courageously share Campus Crusade's "Jesus" Videos with the Talban's death decrees ruling the land, little did they know that their efforts would effectively play a role in opening the door for the Gospel throughout the entire country as believers around the world interceded for their safety. The Church in Nigeria is a mighty Body of Believers who are impacting the world through their prayers. Hear how the the Holy Spirit and the Spirit of Islam have battled for the hearts and souls of this territory and how the Gospel is prevailing with tremendous power via the praying Christian communities. This is powerful. 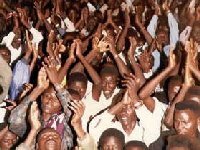 The story of God's grace at work in Uganda via the prayers of God's people. This should give encouragement to every believer who feels that the mountains we face in are too great. When the time was right, the evil power that has ruled the souls in this territory for centuries was broken with the Light of the Gospel. 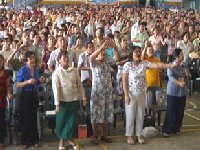 When missionaries came to China in 1865, they probably could not have imagined how the seeds they would plant would be used to bring a series of spiritual revolutions to China in which wave after wave of God's Spirit would save tens of millions. When Communism began to loosen it's grip, What the western Church discovered had been happening in the Church of China, astounded and confounded. What is happening with Israel demonsrates that the God of Israel is the one, true living God. What the Lord is doing in the hearts of millions of Gentiles worldwide toward Israel is nothing short of prophetic. Why would so many Gentiles rally behind Israel, of whom the world has and still is so jealous? The Chosen of the Chosen is turning the hearts of Gentiles toward his very own: Israel. Over the last 20 years, there has been an increase in intensity over the final destiny of the United States and the souls therein. This is a report and encouragement not to give up hope that a Third Great Awakening is about to come to our land. What may seem like a hopeless situation is probably a Divine Orchestration for the greatest revival to ever hit this country. Listen and be encouraged. 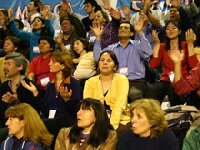 When the pastors of this city of 400,000 came together to seriously seek the Lord, a release of God's presence began to impact the entire area. 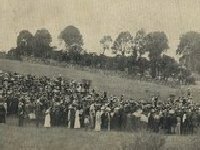 People began to seek the Lord in mass. Before it was over, Revival would hit this city and country with great impact. Noting that God had sent Revival to Ephesus, the leaders used Paul's letter to the Ephesians as a guide to seek the Lord. Very powerful! If you think that things are bad for the first time in America's history, then consider the conditions prior to the Second Great Awakening and be encouraged. The Lord came twice before to save the lost and so He will again come in our case. Call this a prelude to a Third Great Awakening! 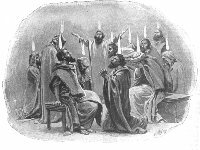 Christ told His followers to wait for the advent of the Holy Spirit. When He came, the Church was born and the Gospel began to sweep throughout all of Israel. As the persecution of the Church increased something else happened that initially confounded Jewish believers, something that would change the course of history. 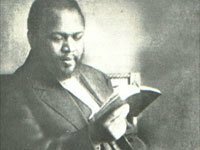 What happens when a missionary is burdened by the Holy Spirit to such a degree that he drops all the traditional activities of missionary work, against all criticism, to seek the Lord until Heaven opens up? The Argentine Revival of course! Hear the true story of God's power to draw His people unto Himself. Evan Roberts could not escape what he knew deep in his heart. He knew that the Lord wanted to come and save the lost. He knew his own heart needed change. He knew that he had to find the Lord. In pursuing the Lord, the Holy Spirit began to deal strongly with him. 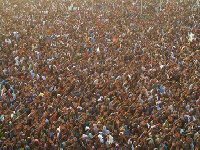 Before it was all done, over 150,000 people would come to know Christ. Jonathon Edwards and George Whitfield could not be more different personally and theologically than most Christians during this period. Edwards was mild-mannered, soft spoken and an intellectual. George Whitfield was animated, outwardly passionate and even theatrical. 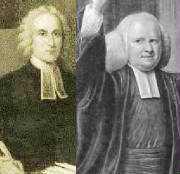 One was Reformed in his Christian experience, the other instrumental in the founding of Methodism. Both were used to stir the masses to seek God. What seemed like a routine college chapel service was interupted by an invasion of the Holy Spirit. A regular service turned into a major prayer meeting, in which repentence and worship were offered up to the Lord. The impact of this event was felt across the country and across denominational lines. 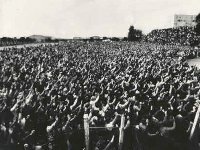 Hear how the Lord came to Asbury in 1970 and impacted an entire nation. The Holy Spirit began to seed the hearts and minds in this country years before the Communists took control. This is the story of how God, despite great evil, is able to bring light to people's hearts. 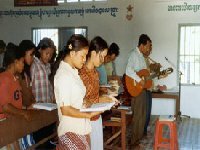 You might take special note on how the praying house church movement impacted the course of history in Cambodia. It is amazing how God burdened a man to call God's people together for prayer, then confirmed the timing by events beyond his control. 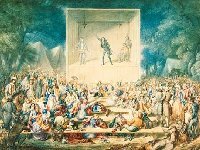 Jeremiah Lamphier refused to get discouraged when attendance was initially small, because the Lord was with him. When the time was right, the Lord's presence would explode and descend upon the souls of our country's east coast. The 1858 Awakening saved many souls and changed the course of American history in the process. 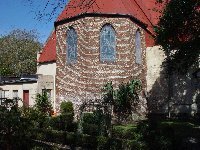 The Prayer Meeting Revivals of 1858, actually started here in Charleston in 1857. By the end of summer, a group of 48 black Christians and 12 white Christians, intensely sought the Lord for revival. Christ is God speaking to the world to every culture, answering the great philosophical questions raised by religion, for Christ is not a religion, but the answer to it. An objective study in world religion and philosophy ought to build one's faith in the Gospel, for no other arena offers an answer to the dillemma posed by the question articulated by C.S. Lewis: "That if a perfect law demands perfect repentence, how can imperfect people perfectly repent?" The answer is that, in and of himself, man cannot and is without hope, if he is without Christ; But for the hungry soul, there is a loving Friend who suffered more than any other, yet never deserved to suffer. He walked a line we could not walk.